This section attempts to standardise and define some of the terminology used in describing tektites. This will aid understanding later in this book when the formation of different morphologies are described and an attempt is made to classify tektites. Tektite morphology varies significantly with distance from the impact site. In this book tektites are divided into three gradational groups based on morphology. The velocity and angle of ejection/re-entry, which controls the varying degrees of plastic deformation, ablation and spallation processes, has significant influence on the final morphologies. The ejection angle/velocity influences atmospheric height at which the tektite is disrupted. Melt composition and temperature and the size of the body will also influence morphology. These variables, discussed in greater detail later, are all inter-related and chart the impact process. Proximal tektites fell within approximately 1,000 km of the impact site. They were ejected at lower velocities compared with more distal forms and were therefore disrupted at lower altitudes. Morphologies are dominated by plastic deformation processes yielding common discoidal forms. Examples include Indochinites, Georgiaites and Ivorites. Medial tektites fell within approximately 1,000 km to 2,700 km of the impact site. They were ejected at velocities insufficient to induce ablation. Most typical sizes cooled, were re-heated during re-entry and suffered spallation. Whilst there is some degree of plastic deformation, medial tektites are typified by the spallation process. Examples include Philippinites, Billitonites and Bediasites. Distal tektites fell beyond approximately 2,700 km from the impact site. They were ejected at sufficient velocity in order to ablate, with most specimens subsequently suffering spallation. Distal tektites are typified by ablation processes (even if this surface has been subsequently spalled). Examples include Australites and Javaites. For the purposes of describing tektite formation and subsequent classification it is also important to define the established terms 'plastic deformation', ‘ablation’ and ‘spallation’. Atmospheric interaction during ejection results in the molten body being deformed under the influence of various forces. This is termed plastic deformation. The tektite is cooling and therefore these non-equilibrium morphologies are commonly locked-in. If velocity is sufficient, ram pressure heating during hypersonic flight results in the melting and stripping of the material from the frontal surface and this is termed ablation. Rapid changes in temperature, resulting in unequal expansion/contraction of the exposed part of the tektite versus the interior, results in the explosive loss of the tektite shell and this is termed spallation. Spallation may occur in response to rapid heating or rapid cooling and may be enhanced by body forces during re-entry. It is interpreted that tektites primarily spall when the re-entry heated surface (which may or may not have ablated) is rapidly cooled during the latter stages of re-entry. The term ‘anterior’ is used to refer to the frontal surface of the tektite, facing direction of travel (approximately facing the Earth's surface during re-entry, if you like). The term ‘posterior’ is used to refer to the back of the tektite, protected from the effects of re-entry, facing the direction from whence it came (approximately facing space during re-entry, if you like). Proximal, Medial and Distal morphologies are readily distinguishable mainly because seas in the Australasian strewnfield result in missing forms and a jump in morphological characteristics, but in truth there is a continual gradational sequence through the morphologies. Distally ejected tektites, like most medial tektites, re-entered the atmosphere as solid and brittle bodies. Distal tektites, however, re-entered at much higher velocities and lower angles when compared to medial tektites. The high velocities led to ablation of the anterior surface, which resulted in flanged tektites. All australites appear to have an orientation (although a few rotated about one axis). The establishment of an orientation is suggested to be due to subtle plastic deformation during the ejection phase. 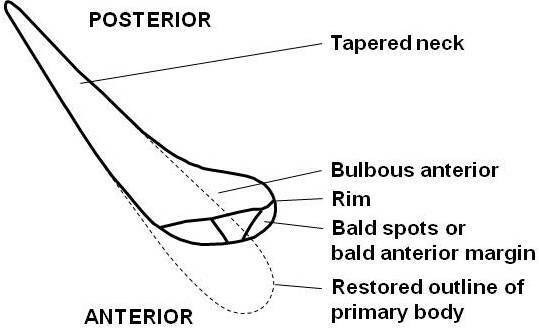 Subtle deformation results in the retention of a spherical posterior as the posterior surface was under low pressure, whilst the anterior experienced high pressure and flattened out. Note that most other literature to date implies distal tektites formed from perfectly spherical re-entry bodies, i.e. undeformed primary bodies and yet offers no explanation for orientation. It is noted that complete flanged buttons (above right) will not usually exceed around six grams in weight (Whymark, pers. obs.) and are more commonly 4 grams or less. This is because, after the tektites are ablated, atmospheric impedance slows the velocity of the tektite. As velocity decreases the bow shock wave and protective boundary layer are lost. Heat loss exceeds heat gain and the anterior surface of the tektite is rapidly cooled. This results in spallation. Only the smallest of bodies cool sufficiently evenly to avoid breakage of the glass and thus retain their flanges. Distal tektites often form a unique equatorial core (right), which is globular in morphology with detachment scars around the equatorial margin. This unique morphology is considered to have formed due to the limited plastic deformation during the ejection phase, followed by an ablation stage. Equatorial cores are not found at medial distances where ablation did not occur, although globular cores are present. The smooth posterior primary surface of australite cores and flanged forms is readily established. It appears to be perfectly spherical (except on a few large bodies) leading to the assumption that distal forms are derived from perfectly spherical primary bodies. ABOVE: Descriptive terms used for flanged australites. ABOVE: Descriptive terms used for australites cores. For the most part, an orientation is easily established for medial tektites, which include philippinites and billitonites. The primary body was plastically deformed during the ejection phase and therefore necessarily oriented during re-entry. The anterior surface heats up during the initial phase of re-entry and is spalled, due to rapid cooling, in the latter stages of re-entry. The lenticular to globular core morphologies (right) are a reflection of the degree of plastic deformation, as spallation removed a similar thickness of material in each case. 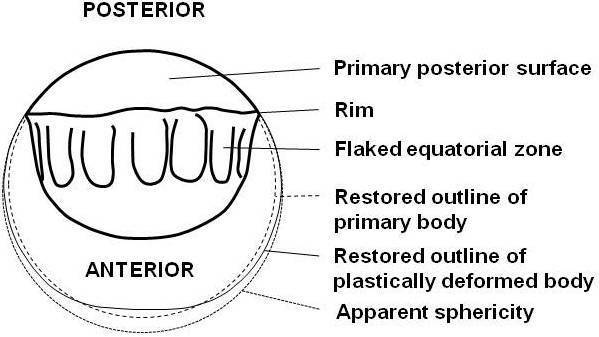 The primary posterior surface is smooth and initially appears spherical, although detailed investigation reveals an ellipsoidal surface. The anterior surface is often grooved as a result of terrestrial chemical weathering of cracks on the spalled surface. Navels form due to the chemical enhancement of conical fractures interpreted at Hertzian cones. The first formed tektites are the most distal forms - ejected at the highest velocities, heated to the highest temperatures and formed from the sediment closest to the surface. The lasst formed, lowest temperature tektites, formed from the deepest sediment, are the proximal forms. All medial tektites re-entered the atmosphere with a solidified exterior, which was resistant to plastic deformation. As such, a perfect sphere, which formed above atmospheric effects and suffered no distortion whilst molten, may have no fixed orientation during re-entry. The body will tumble (roll, yaw and pitch) and re-entry heat will be more evenly distributed over the body. 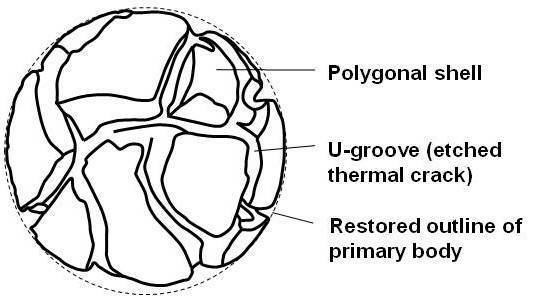 In medium sized bodies, which cooled throughout prior to re-entry, polygonal cracking occurs over the entire surface, resulting in a breadcrust form (right). In smaller bodies exactly the same cracking occurs, but it is imperfect and more meandering in nature. 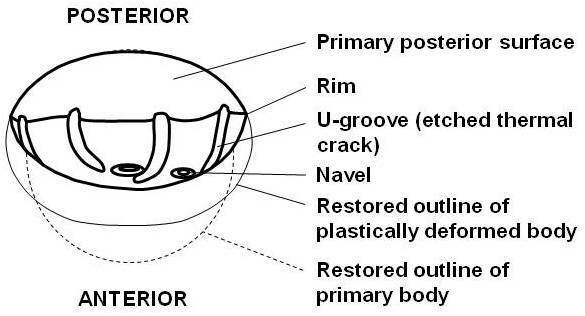 Only if a shell fragment is lost will a late-stage orientation be established for the body. A late-stage orientation appears to be a very common feature amongst the breadcrust medial tektites. Where this exists, the late-stage posterior surface is recognised by the rounded shape and may be pock-marked by terrestrial weathering. In larger un-oriented bodies a smooth surface results. Whilst larger bodies encountered the same re-entry processes as medium and small bodies, they remained hot in their interior during re-entry. They were sufficiently cooled on the exterior to resist plastic deformation, but the interior retained sufficient heat to resist the late-stage brittle crack formation. One can observe a continuous sequence from small to large un-oriented morphology and sculpture. ABOVE: Descriptive terms used for philippinite cores. ABOVE: Descriptive terms used for philippinite breadcrust tektites. The orientation and nomenclature of proximal tektites is often confused, but once an understanding is gained then they can usually be oriented. An incorrect assumption is often that the smooth surface of an indochinite is the anterior surface: In fact this is always the posterior surface. This fact is most readily understood by studying teardrop-shaped tektites (right). In well preserved indochinites an orientation can always be established. This is because a molten body interacting with the atmosphere will always plastically deform towards a stable configuration. As soon as a body is even slightly distorted from spherical it will have a fixed orientation. Most of the descriptive terms for indochinites are well established in the science of tektites, but a couple of new terms are introduced in order to describe features seen on indochinites. Firstly, it is proposed that the concave depression seen on the anterior surface of indochinites be termed a ‘punt’. This term is derived from man-made bottle nomenclature used to describe the depression in the base of a wine bottle. Secondly, it is proposed to use the term ‘sump’ to describe the concave depression seen on the posterior surface of some plastically deformed indochinites. ABOVE: Descriptive terms used for indochinite teardrops. ABOVE: Descriptive terms used for indochinite discs. During re-entry tektites will orient (or attempt to orient) themselves in the most stable configuration with the blunt and heaviest end (if any) facing the direction of travel (see below). ABOVE: Stable fall-orientations of tektites. Direction of travel is directly down in these images. The tektite positions itself blunt side down, oriented with respect to the center of gravity. If plastic deformation has occurred during ejection a natural orientation will be established during re-entry. Once the orientation is established, the axes of a tektite can be defined (see right). Some elongate forms may rotate about the long axis perpendicular to flight, termed the roll axis, and may not establish a stable orientation. Whether ablating or spalling, tell-tale signs are left as evidence of this roll. Many tektites will rotate about the axis aligned with the flight direction, termed the yaw axis. Often there will be no evidence of yaw in the final morphology except in ablated bodies that retained their aerothermal stress shell. Tektites may roll or yaw or do both, but they were typically stable in pitch as this was self-corrected by aerodynamic forces. A slight axial wobble, rotation about the yaw axis with a slight change in pitch is evident in some australite buttons. 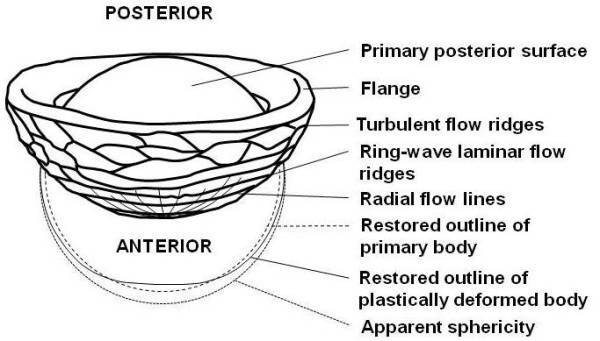 Perfectly spherical forms may initially have been unable to find a stable orientation and will tumble (roll, yaw and pitch) until ablation or spallation creates an imperfect sphere and a stable orientation may be established. In most australites a stable orientation is evident. Some specimens such as canoe-forms clearly yawed, some rolled and some showed axial wobble: yaw, with a slight change in pitch. In philippinites, again, the majority of specimens have a stable orientation. Yaw cannot be commented upon as it would be undetectable in spalled medial tektites. Clearly some elongate philippinites rolled during re-entry. Common examples exist of spheres that have apparently tumbled (rolled, yawed and pitched), unable to establish a stable orientation. Other philippinite examples appear only to establish a stable orientation in the latter stages of re-entry. ABOVE: During atmospheric re-entry the tektite will attempt to establish a stable orientation. Some specimens, however, clearly rolled or tumbled around one or more axes. 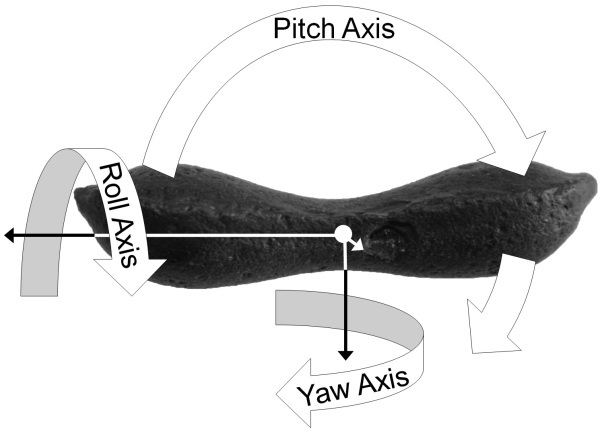 The pitch axis is the short axis perpendicular to flight. In general, tektites are stable about the pitch axis. The roll axis is the long axis perpendicular to flight. The yaw axis is the axis aligned with the flight direction. In this image the flight direction is down. Indochinites are typically oriented and this is likely due to disruption of the melt at lower atmospheric levels. A plastic body will very readily develop an orientation by deformation. Of note, in indochinites, is that some still molten indochinites have been plastically deformed whilst still traveling with inherited cosmic velocity, before a stable orientation is established. Plastic deformation probably occurred during the ejection phase and in some cases continued during re-entry. Please see the Nomenclature & Classification main page for references used in this section.